In a recent interview with SafeBee, Erik Moen discussed neck pain and soreness resulting from poor bike positioning. It is an incredibly common issue with cyclists of all levels, from the absolute beginner to commuters, and even seasoned racers. In this post, I will be comparing and contrasting the approach Moen discusses here on BikePT and in the SafeBee interview with my own unusual adjustments, made necessary by past neck injury. Although I have been professionally bike fit for years, a neck injury required me to significantly adjust my position. I had been living with neck pain for many years, but as I got older I found myself less willing to put up with it as on-the-bike pain increased. That meant riding less, yet riding is my favorite time, that time when I feel most alive, so I had to find a solution. One solution was to ride upright. In fact, my doctor suggested I shift to riding exclusively on a windtrainer so that I could be literally upright at all times. The thing is, while windtrainer rides are tolerable, I love riding my bike outside. Every ride, I would start out with good riding posture, but as my core tired and my lower back slouched, it put more pressure on my shoulders and neck. That resulted in neck pain on the bike that was shortening ride times to just 30-45 minutes, not enough to reach a point of being thoroughly warmed up and hitting my usual sweet spot about 3-4 hours in. Additionally, I was unable to keep my neck at a sharp enough angle to see the road on steep descents, and the problem was made worse on particularly long descents, where the pain caused a much more significant safety issue. Time for core work and radical bike fit changes. Core work: I started with core workouts that involved just two exercises, straight out of ‘The 4-Hour Body’ book by Timothy Ferriss, the ‘Myotatic Crunch’ and the ‘Cat Heave’. I chose these not so I could have six-pack abs, but specifically because they can be done in just a few minutes per day, and they actually work. Note that the Cat Heave is not an easy exercise, so as with physical therapy exercises, you need a certain commitment to a daily dose. In the SafeBee article, Moen notes that “On a road bike with a steeper forward lean, it puts a lot of extension on the cervical spine.” In non-medical speak, cervical spine equals neck. It is the cervical vertebrae, those just below the skull, literally carrying the massive responsibility of supporting your head. By the way, the upper part of your cervical spine is sometimes referred to as the ‘Yes joint’ because it enables your head to nod up and down. The cervical spine is supposed to be quite mobile, but injury can reduce mobility. Before these changes, every time I even thought about riding, my yes joint was saying ‘No!’ If you have neck pain, you know what I’m talking about. It is a rather massive deterrent to getting on the bike. Even if you do not have neck pain, a poor position can cause similar issues. People who say, ‘I’m not made to ride a bike,’ are often unwittingly referring to the unusual sensations caused by a poor bike fit. Positioning: If you look at any nearly any professional road rider’s position, you can see what Moen is talking about; the amount of drop from the top of the saddle to the top of the handlebars is huge, often to the tune of 12-25 cm or more. I identified that drop as the source of on-the-bike pain, and found that although it is counterintuitive after so many years of racing, reducing that drop – in my case to 5 mm – is a critical factor in eliminating neck pain. This adjustment allows me to decrease the forward lean that Moen mentions. It feels a bit odd at first, the change rendering less of a power pull on the bars, but I quickly got used to it after only one ride. You might wonder why I did not just switch to a different bike type such as a hybrid that allows for a more upright position? The simple truth is I strongly prefer the sensations available on a road bike. From ride type to terrain to muscle use, it just suits my personality better. I frequently seek new stimulus, and I need distance to get that. A road bike is the most efficient bike type for long distance riding. 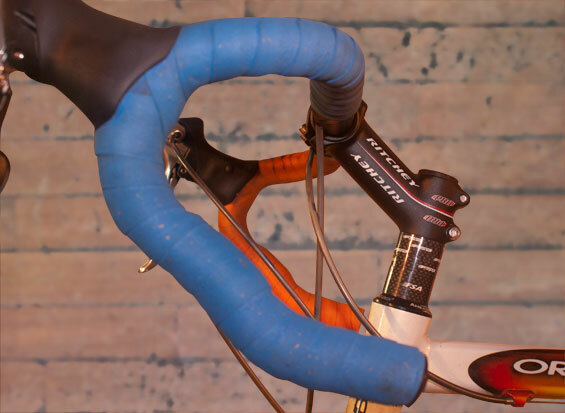 Saddle tilt and profile: Many riders tilt their saddle forward with the idea that it will alleviate private part pressure, but the truth is the opposite. I have long preferred a neutral saddle position, yet it has been difficult to find saddles that allow a neutral position while not restricting my natural pedal stroke with early flare at the sides. Moen recommended a Selle Italia Turbomatic GEL saddle, which features a late side flare. It was a perfect fit. This is significant because if the saddle flare forces interruption of the pedal stroke, it can cause you to be constantly moving forward in the saddle – even with a neutral (not pointing down) saddle position – which causes your upper body to work harder. In my case, it resulted in fatigue and neck pain. Finding the right saddle profile made a big difference. Stem angle and handlebar height: Next, I alleviated the pain caused when my lower back became fatigued by switching out to a +30 degree stem, an unusual change resulting in the bars looking like they are too high. Moen notes that, “Handlebars that are too low or too high, too close or too far can be a problem.” Yet in my case, the higher bar height equals less neck extension and less pressure on my neck and shoulder muscles. Before the changes, I noticed on rides lasting longer than 45 minutes, my neck and shoulders would tire, most often resulting in pain, then I constantly tried supporting my neck at different angles all the way home. After that happened, even with post-ride stretching, I would get a stiff neck for a day or two. That’s a strong deterrent to getting on the bike, so I knew this was a problem that needed attention. Handlebar width: I swapped out my correct measurement 42 cm bars for a wider 44 cm, which allows me to keep my shoulders slightly more open and relaxed, taking pressure off my neck. To look at the small adjustment, it seems like it would not do a thing, yet consistently, the minute change makes all the difference in the world. Another factor is in the type of handlebars I am using, which, although not the latest and optimal profile, feature just 120 mm of drop so that when I get down into the drops on a steep descent, I don’t have to extend my neck as far up to keep my eyes safely on the road. A more typical drop measures 125-135 mm, so we are talking about only 5-15 mm, which seems insignificant, yet again, the smallest changes make a big impact on comfort, and that equals a safer and longer ride. These changes to position seem to go against conventional bike fit, yet most of them might also be considered essentially hyperextensions of best practices. For the average person—those bike riders lacking a neck injury—these changes are probably not necessary, with standard bike fit recommendations working perfectly well. For those with a neck injury, however, these or other adjustments can make enough of a difference to keep you on the bike. After I made my equipment changes, Corpore Sano Physical Therapy made a couple of additional changes to saddle height and handlebar angle that really dialed it in. In my racing days, I would have called this a ‘Fred’ position (bike snob lingo for ‘geek’), but now I am happy it keeps me pain-free and riding (and I don’t much care how it looks). Incidentally, a few weeks after we perfected my position and I had put in many pain-free rides of 2-4 hours, my frame broke. I had to get back on my next closest fit bike, one a bit smaller than my ideal frame size, and what I encountered was a wholesale return to neck stiffness and pain after most rides. Position is everything! If you need to make extreme or unusual changes to your position, be sure to document your measurements. Also, if the changes take the neck pain out of your riding, be prepared to stand your ground when others challenge your modified position or try to talk you into changes to please their notion of the way your bike ought to look. How it feels and rides is what matters. Being on the right size bike, with components that fit the bike to the rider – with adjustments specific to your body and any existing injuries or other unique issues – can literally make the difference between staying home or riding your bike.